On our return drive to Hanoi at the end of the NE tour, we felt so depressed at the thought of returning to the boring and predictable tourist bus trail that the only way of cheering ourselves up was to plan the next motorbike trip - this adventure would take us to the NW. After battling against the Hanoi traffic (great buzz) to escape the city we soon hit spectacular mountain vistas and felt the joy and freedom of being on two wheels again. Freewheeling down the mountainside to Mai Chau was thrilling, the village itself unspoilt in its rural setting. We stayed in the Montagnard village in a traditional wooden house owned by a family who served us a delicious array of food. The highlight of this trip was of course the ride through the Fansipan mountain range to Sapa which was especially beautiful at dusk when the light brings out the colours of the paddies, rivers and mountains. As the sun set leaving a red glow in the sky we arrived in Sapa. The hill tribe groups in this region wear such colourful clothes that no matter how bad your hangover you'll soon forget it. We had a wonderful fun filled time on both the NE and NW tours. Explore Indochina was rightly well reccommended by a friend who had done the NE tour last year. Our guide was such fun to be with and a great entertainer; no matter how much rice wine he had drunk the night before he always had a smile for breakfast. 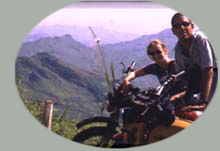 Fluent in Vietnamese and having toured this area extensively he had an excellent rapport with the people we met which heightened the feeling of discovering and experiencing Vietnam in a way that would have been impossible without 2 wheels and an excellent guide. Many thanks for 3 weeks that we will never forget.